Flea & Tick Facts - Delavan Lakes Veterinary Clinic, S.C.
Hooray for the warm weather! Unfortunately, warmer temperatures mean fleas and ticks are active, and boy, are they active this year. Effective flea and tick control for your pets is very important, and luckily, we now have good products that can keep your pets safe and healthy throughout the flea and tick season. Wisconsin primarily has two kinds of ticks, deer ticks (black legged ticks) and wood ticks. 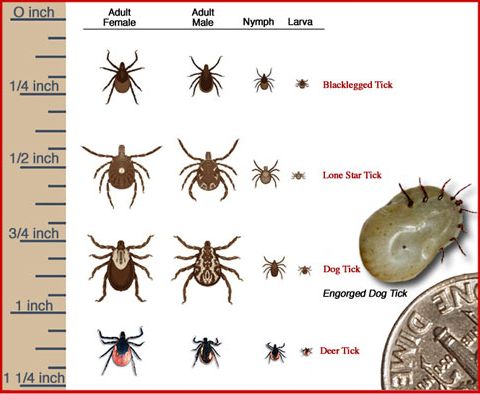 While all ticks can carry illness and diseases that can affect animals and humans, it is the smaller deer tick (no larger than the head of a pin!) that carries Lyme disease. Ticks crawl up on the tall grass outside and wait until a “host” passes by, then jump aboard to feed. 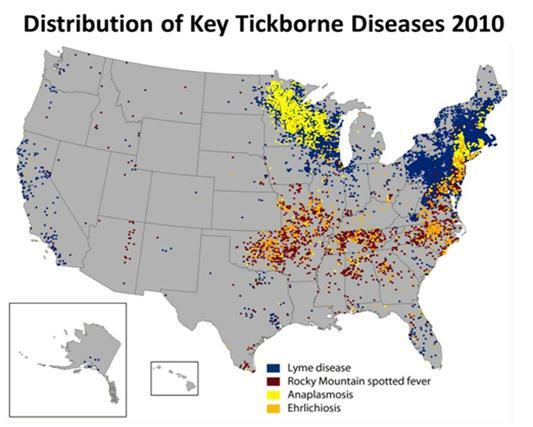 It’s important to remove them as soon as possible, but a deer tick must be attached to its host at least 24 hours before Lyme disease can be transmitted. The incidence of Lyme disease continues to increase in Wisconsin. 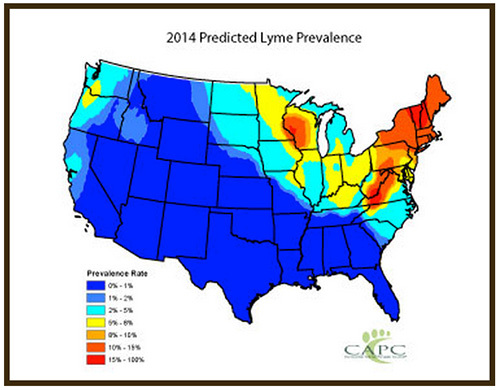 Approximately 10% of the dogs we test here at our clinic test positive for Lyme’s disease. To protect against Lyme disease, your dog must receive a Lyme vaccination before being infected. Even with the vaccine, it’s important to use a monthly topical flea and tick repellent that can kill the mites throughout their life cycle. Vectra® 3-D is a good tick repellent. It works by mixing with the oils in the animal’s skin and then spreading to the entire body. It’s important to work the topical into the skin, not just the hair, and not bathe your pet for several days after the application to ensure that their entire body is protected. A new option on the market is Bravecto®, a chew that is administered once every three months. Ask your vet about the best choice for you pet. Ticks aren’t the only disease-bearing hazard outdoors. Fleas transmit tapeworms and diseases to your pet, not to mention secondary skin irritations and even flea allergy dermatitis and hair loss from scratching. Fleas are notoriously difficult to treat. Only 5% of fleas live on your pet, the other 95% live as eggs, larvae, or pupae in the environment—the woods, your yard, your carpeting and furniture, and even your car if your pet travels with you on a regular basis! Even if you kill the fleas on your pet, you have to keep using the topical products on an ongoing basis to deal with the continuously hatching fleas in the environment, just waiting to jump back on for a ride and a meal. After being outside in the grass or woods, do a “tick check” on yourself and your pet before you go back inside. If your pet has a tick, use a tweezers or tick removal instrument to forcefully pull it out. If you are not using gloves or a Kleenex, wash your hands well after touching it. Ticks carry a number of diseases, some of which are transmitted by touching or smashing them. If the tick breaks off as you try to pull it out, the mouth parts may be left embedded in the skin. Keep an eye on the area for infection, as chances are a small red bump will form as the skin works the tick head out. If your pet has an embedded tick, or you suspect a deer tick bite, call us for an appointment. We will prescribe antibiotics and test for Lyme’s Disease. We also carry a line of proven and tested products to treat your home for those pesky fleas! As the Lakes Area premier small animal veterinary clinic, we provide comprehensive services for pets of all types and sizes. From highly trained veterinarians to our compassionate and competent staff—our focus on your pet’s health, and happiness can be found in everything we do. For more information, see our article Protected From Ticks...Or Not?